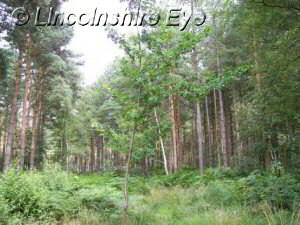 Willingham Woods is situated just east of Market Rasen, on the A631. It is a stretch of woodland owned by the Forestry Commission and a popular destination for walkers. The woods are open to cyclists, and also to horse riders who have obtained a permit. There are a number of different trails through the woods, some of which are paved. Although you will find some markers, there is not an abundance of signposts so it's easy to find yourself lost. In the woods themselves there are areas of densely planted conifers, where little light filters through to the forest floor, which is comparatively barren of life. These are interspersed with areas where native deciduous trees thrive, and here you will find a much greater variety of plants below the canopy of trees. Various waterways run through the woods, including Wass's Beck, the river Rase, and other small streams. 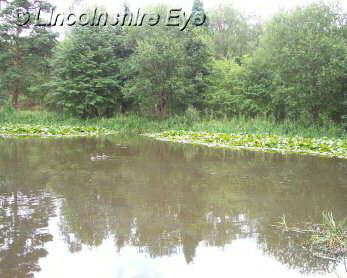 One of these feeds into Willingham Ponds, pictured on this page. If you are hoping to see some wildlife, don't come during the summer months, since the woods are popular and can get quite busy. Although you may see plenty of insects and a few ducks, you will be less likely to catch a glimpse of larger animals such as the deer that inhabit these woods. Parking and toilets are available, as well as a refreshments kiosk. The smaller Legsby Woods is to the south.